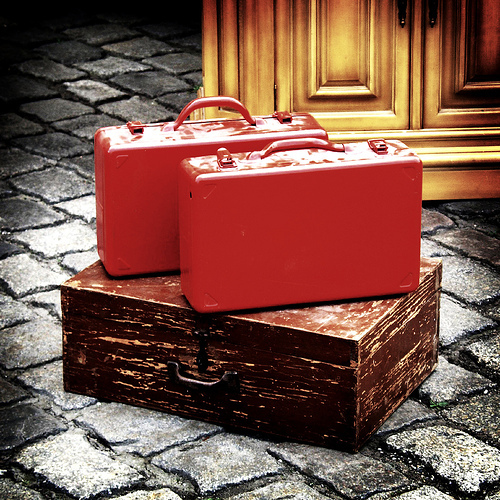 Until last night my red suitcase, my faithful companion of the last few weeks, held court over my kitchen. Blocking the small cabinet next to the wall and door, it made its presence known every time I walked into the kitchen. Leaving or entering the house, it was there—propped open, waiting to be emptied or moved. It does this after every major trip we (my suitcase and I) make. My house is very narrow and tall. The entrance is on the middle floor, the laundry is on the bottom floor, the bedrooms and bathroom are on the top floor. Leaving my suitcase in the kitchen seems abundantly wise and practical whenever I come home. The things that need to go to the laundry aren’t carried upstairs to be carried downstairs a little while later. Things that need to go upstairs get put in their places sooner because they’re out of the suitcase. The kitchen has more open floor space than any other room . . . even after the suitcase takes over. The suitcase and the kitchen go together quite well upon returning from a trip. Last night the suitcase-kitchen combination started to grate on my nerves. I was disgusted with myself for not finishing yet another thing that I started—emptying said suitcase. 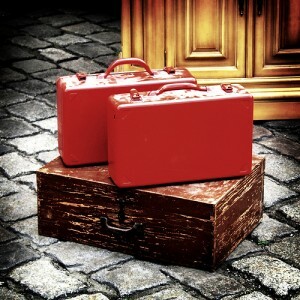 Suddenly I realized the Red Suitcase Correlation. There is a direct proportion between the number of days the valise can remain in the middle of everything and the number of days it takes me to get over jet lag. If the one day for every hour of time zone difference holds true, I should pretty much be over jet lag tomorrow. The suitcase moved upstairs and is almost empty. Perhaps when I finish unpacking it tonight my body will have finished reeling in my soul and I will be home.